Arizona is full of white-knuckle canyon drives, and this week I’d like to share another one with you. 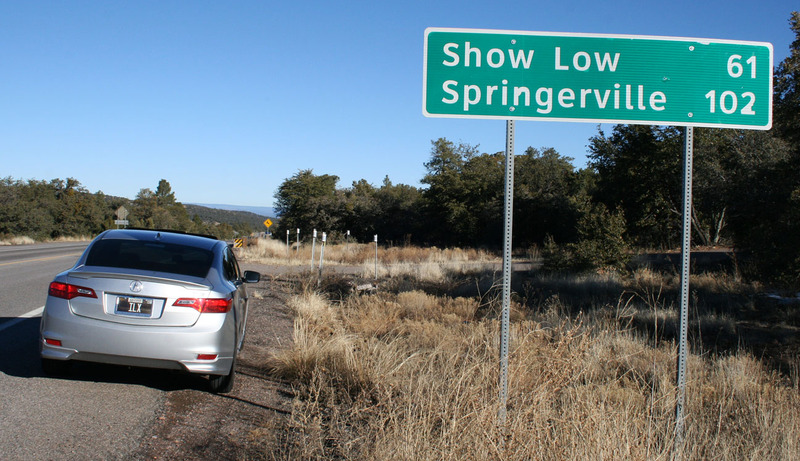 On a brisk 41-degree Christmas morning in Phoenix, armed with a chocolate milk, an iPod loaded with good music, and a full tank of premium fuel, I headed out in the ILX to the White Mountains to attend a luncheon with friends in Show Low, Arizona. 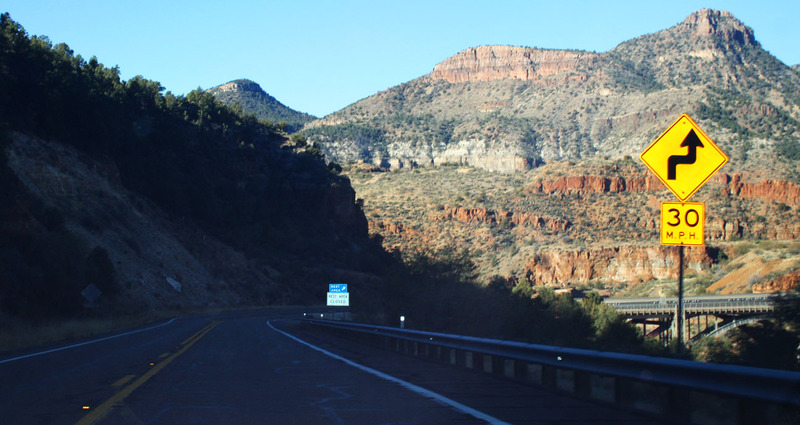 This drive would take me eastward on US Highway 60 through the Salt River Canyon Wilderness which comprises over 32,000 acres of terrain in the Tonto National Forest. 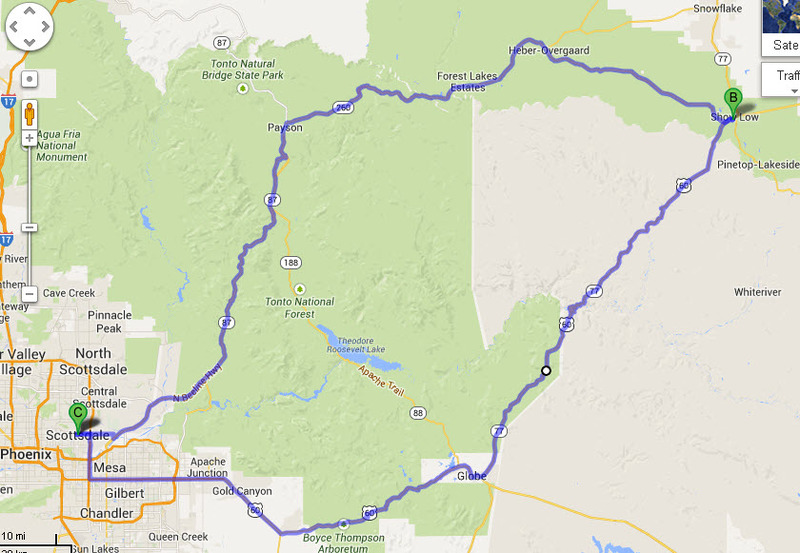 My favorite stretch includes the 87 miles between Globe and Show Low — the focus for today’s discussion. 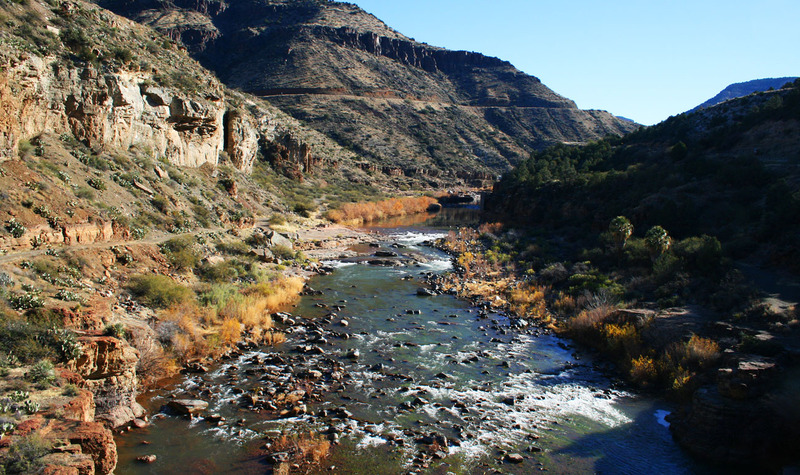 The Salt River Canyon is been referred to as a “mini” Grand Canyon, and for good reason. Around every turn is a scenic panorama of sandstone cliffs that defy gravity and entertain the eyes. 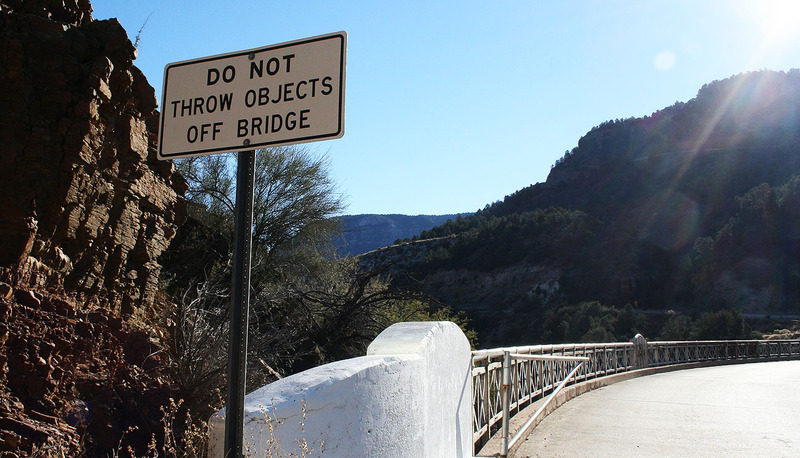 And unlike its big brother canyon in the northern part of the state, Salt River Canyon can be driven from rim to rim; just don’t bring a passenger who gets easily motion sick. There are oodles of curves that require maximum driver attention. 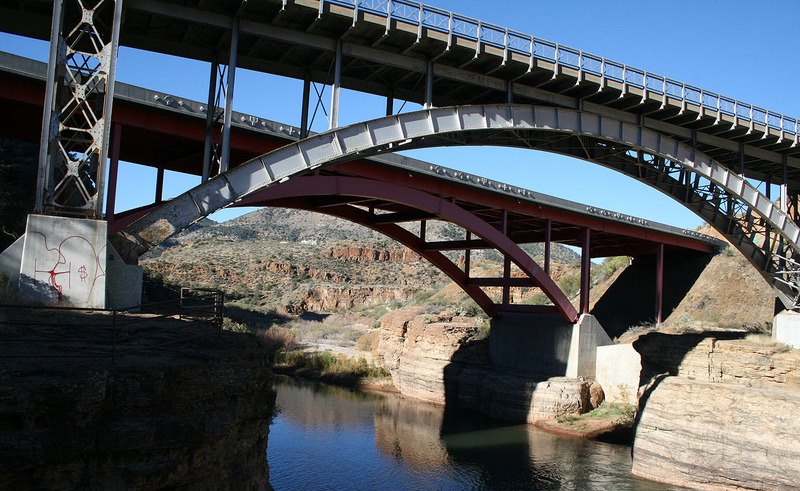 Highway 60 is a two-laner that falls 2,500 feet in elevation over the course of just a few miles to the canyon floor below, where for millions of years the Salt River has been carving out its course. 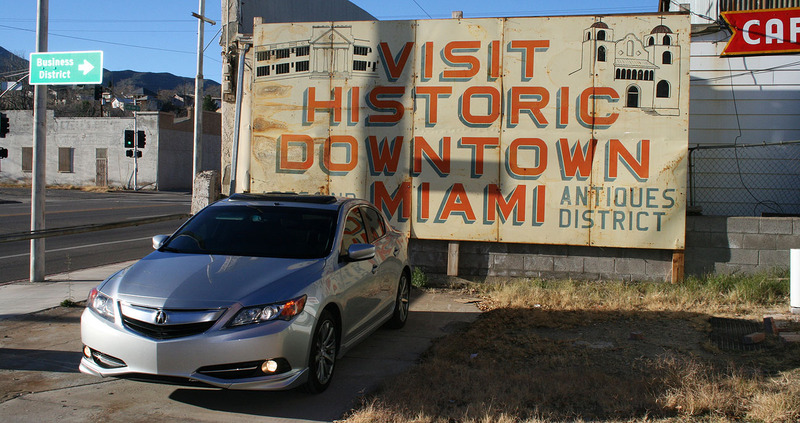 The ILX made short work of the 6% grades since I was able to downshift into 3rd gear for the 25 mph curves and rarely hit the brakes. 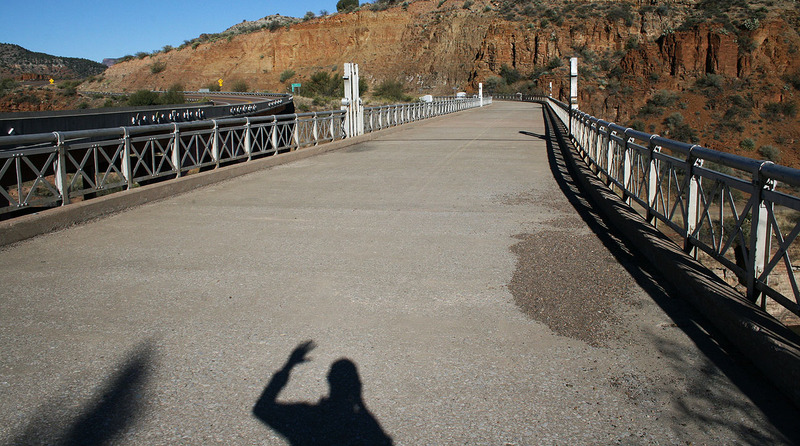 At the base of the canyon, an eerily vacant rest area along the river’s edge provided a prime place to view the existing bridge as well as the old bridge which runs parallel to it. A concrete barricade prevented me from being able to use the rest area parking lot. Grass was growing over a foot tall out of the pavement, so it was very clear that this place hadn’t been in use for quite some time. 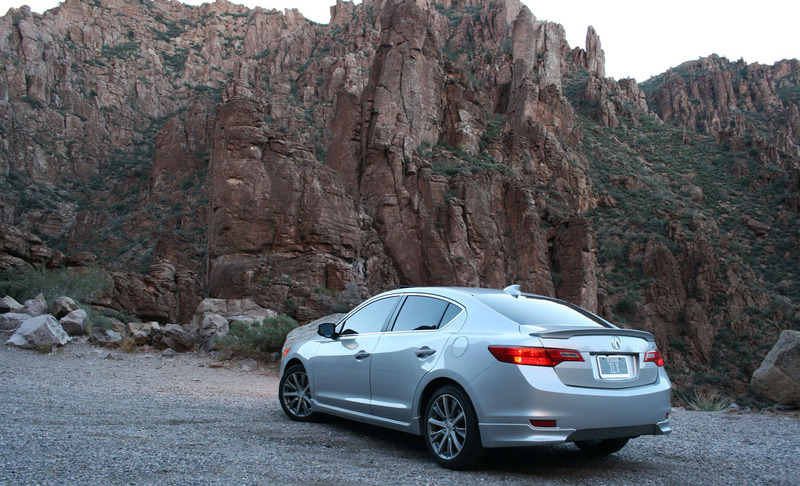 I took the opportunity to park the ILX a little further up the road and do a little hiking around. Constructed in 1934, the original bridge is 454 feet in length and is still fully intact, though it’s used only for foot traffic. 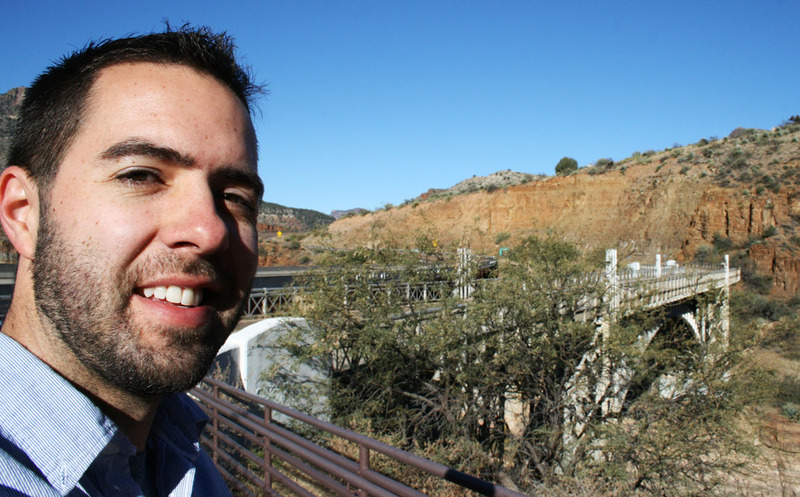 I walked across it – as fascinated with the canyon view as I was with the historic bridge itself. 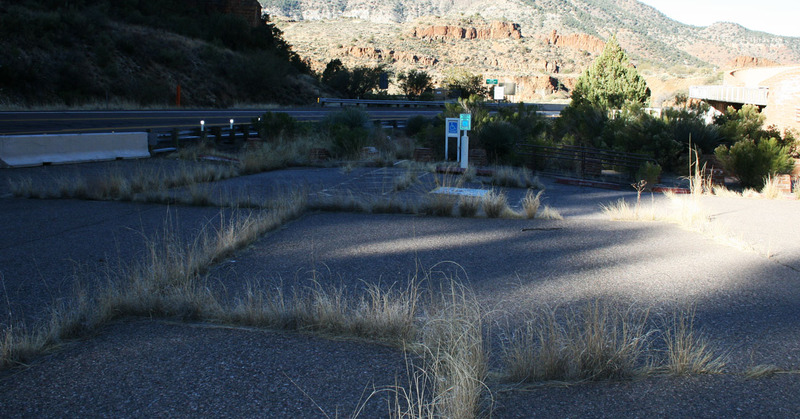 The Salt River Canyon rest area (among many others in the state) was closed in 2007 due to budget issues. 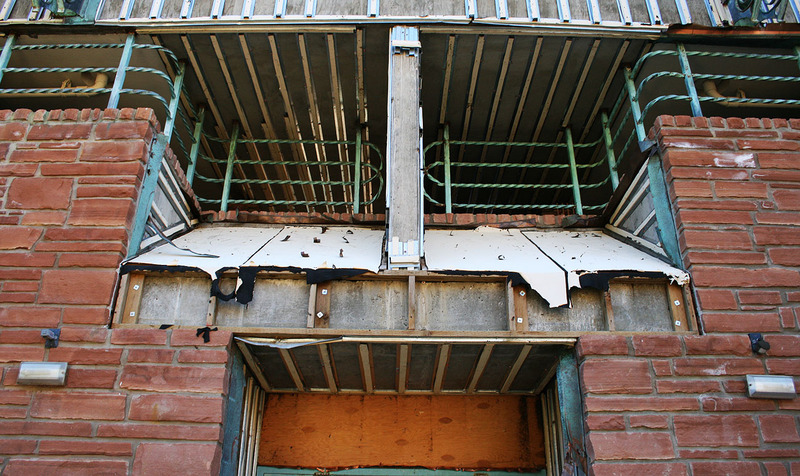 In the 6+ years since that time, it’s fallen into quite a state of disrepair. 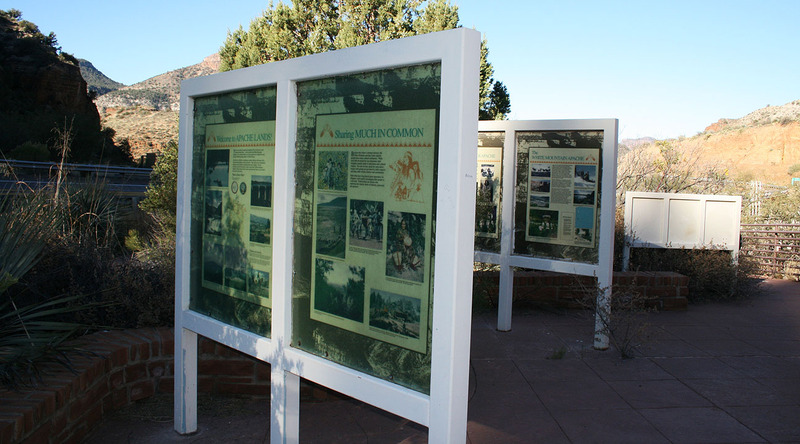 Some of the interpretive signs were vandalized, the landscaping has overgrown, and the building itself has taken on a scary appearance with chipping paint on its trim. I walked around the stone building with is intricate staircases and metalwork, thinking to myself what a shame it was that people could no longer stop there. I did learn some good news, though. As of October of this year, it was announced that restoration efforts will bring the rest area back into service sometime in summer 2014. I’m anxious to see how the facility turns out. With eagerness, the ILX ascended those 2,500 feet to put me back among the pine trees and a light dusting of recent snowfall along the road’s edge. I powered through the curves with the road almost entirely to myself. 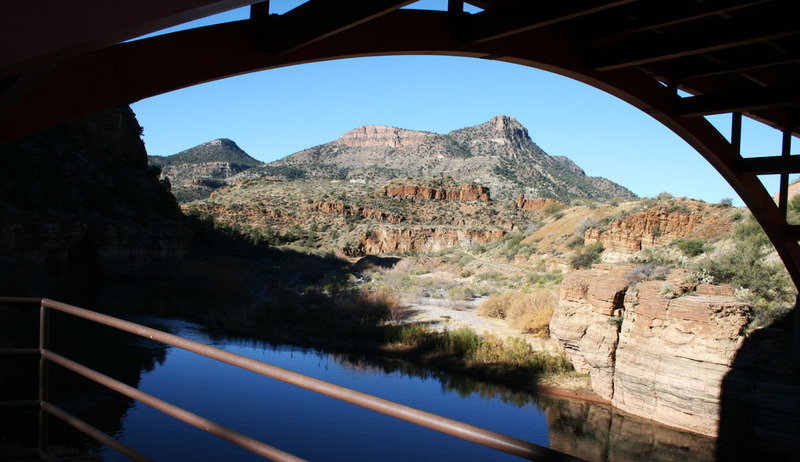 The Salt River Canyon scenic drive is one that should not be missed. Check out my pics below for a taste of some of the terrain that I covered on a beautiful Christmas Day drive. 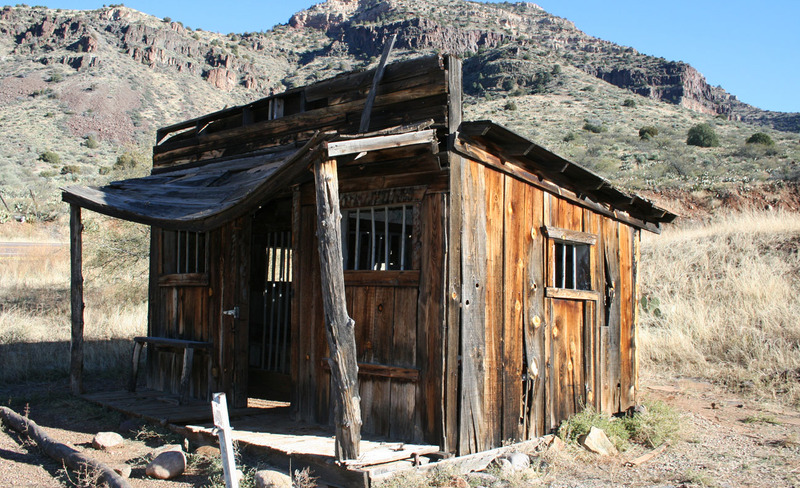 Miami, Arizona – like so many other historic towns of the southwest, this place got its start in mining. 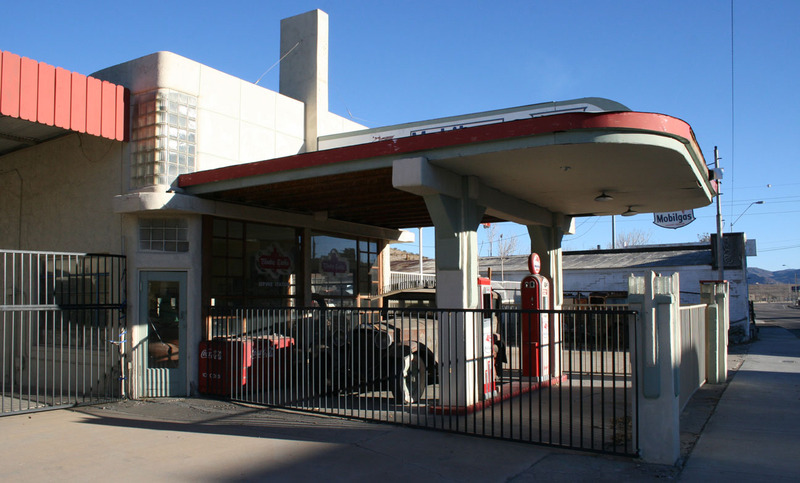 This Mobil station stands as a forgotten relic of the past. It’s been fenced off and closed up, but is a clear reminder of the olden days. There are even vintage vehicles sitting around. I would have loved to see this station in its heyday. According to the legend, the city was named after a marathon poker game between C.E. Cooley and Marion Clark. The two men decided there was not enough room for both of them in their settlement. The two men agreed to let a game of cards decide who was to move. According to the tale, Clark said, “If you can show low, you win.” Cooley turned up the deuce of clubs (the lowest possible card) and replied, “Show low it is.” The stakes were a 100,000 acres (400 km2) ranch. Show Low’s main street is named “Deuce of Clubs” in remembrance. 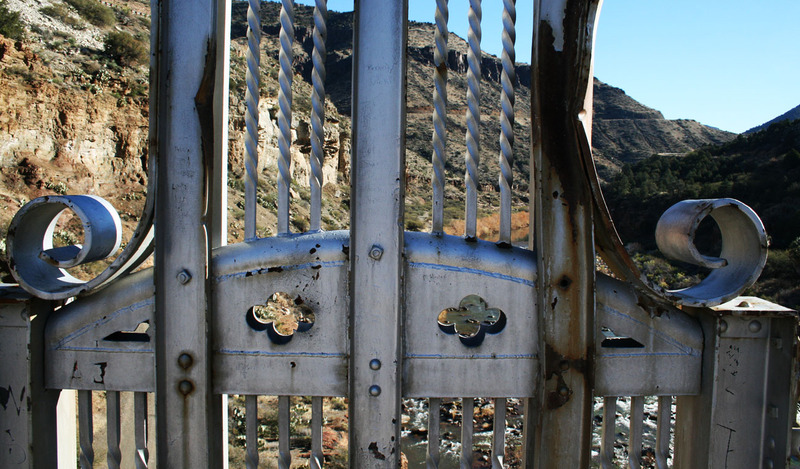 Visible from one side of the canyon is the road that escalates up the other side. See that slice toward the bottom of the picture frame? Here is the approach to the (now-closed) rest area. 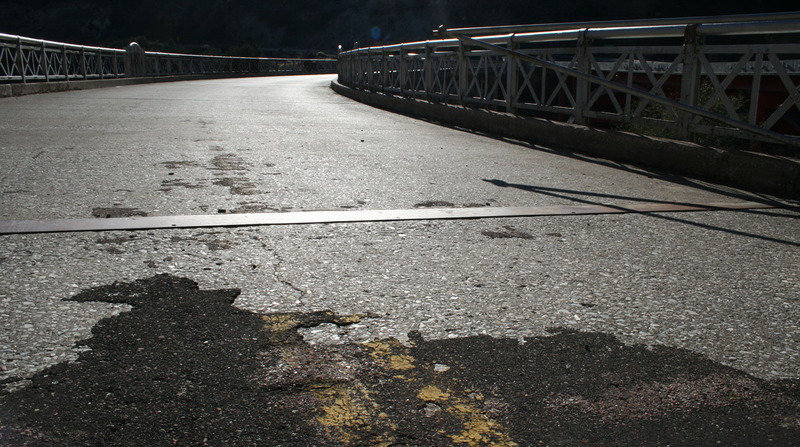 Pavement markings are still visible, even though this has been closed to automobile traffic since 1996 when it was bypassed. Photo of the new (red) bridge, as taken from the old. 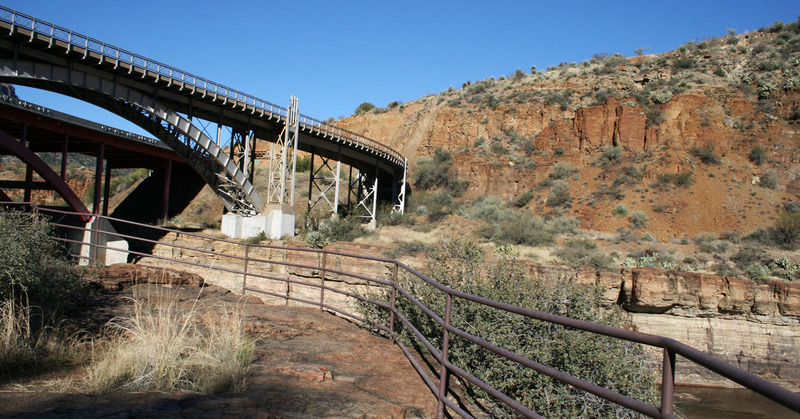 View of the Salt River, looking east while standing on the old bridge. Also visible is the highway which ascends about halfway up the mountainside. This is the rest area parking lot – clearly showing the overgrowth that has taken its toll on the facility. Following are a few pictures of the rest area which has been closed for over 6 years. View of the backside of the building. 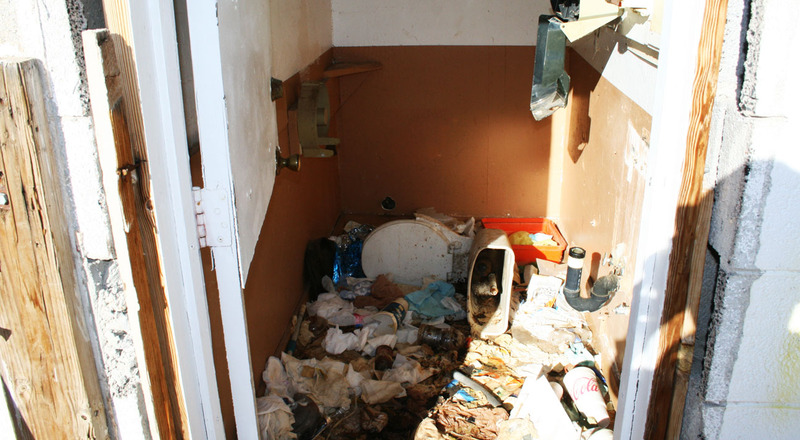 Large metal doors into a utility room of sorts were wide open. I walked inside and found only trash and rubble. 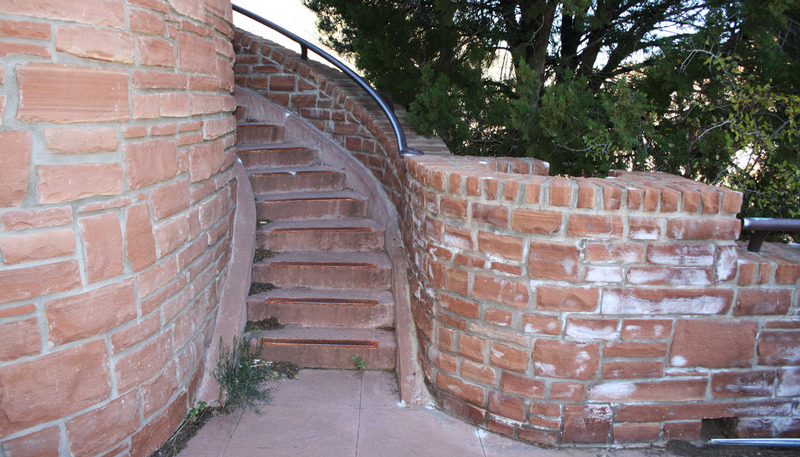 These elaborate curved staircases line each side of the rest area. 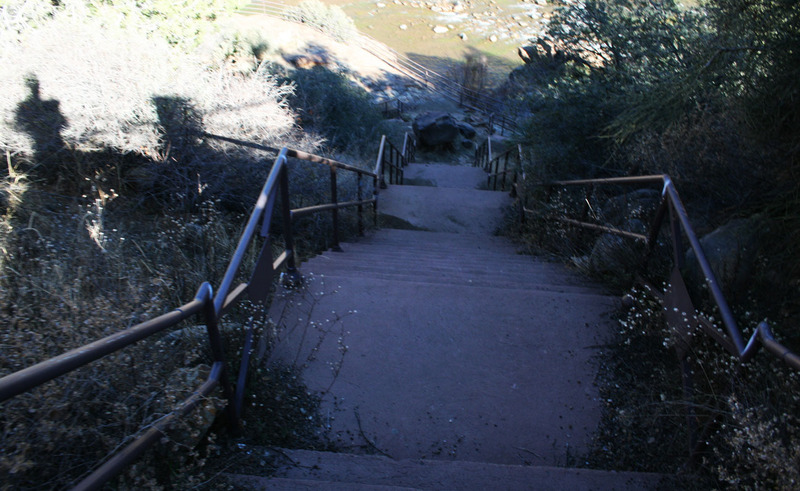 Steps leading down to an observation deck overlooking the Salt River. 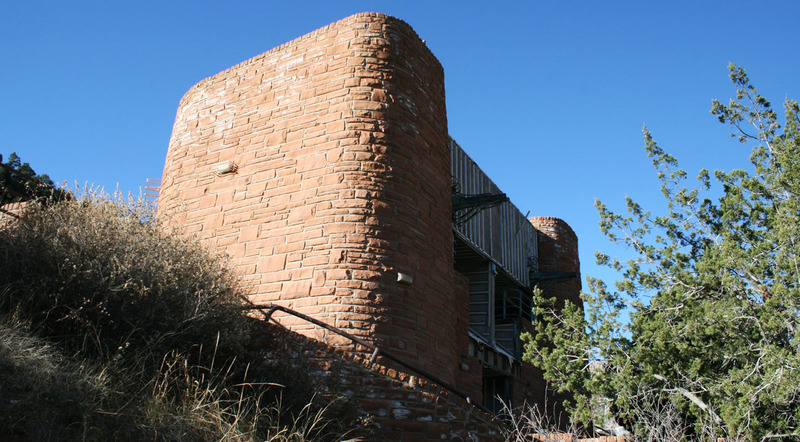 View looking up toward the rest area building from the staircase. Old bridge in the foreground; new in the background. This was a peaceful, serene place to hang out for a few minutes. I heard only 2 or 3 cars drive by during my entire stay at the vacant rest area. Back at road level, a picture of me with the two bridges in the background. One thing that I love about old infrastructure is the level of effort that has gone into making things beautiful. Look at the intricate metalwork on the railings that line the bridge deck. 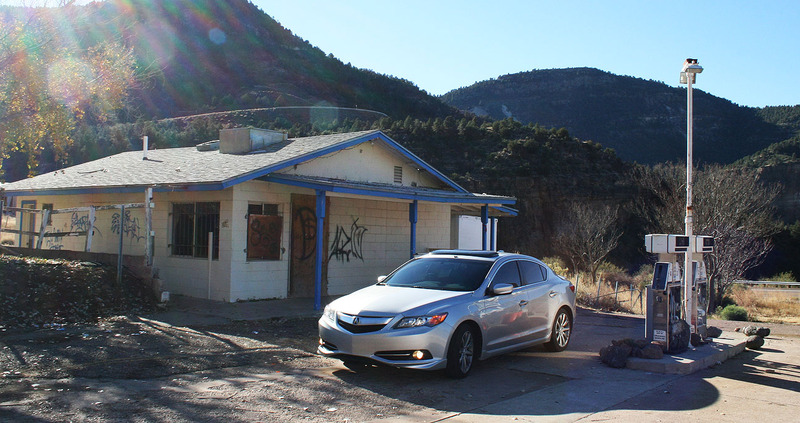 Here’s where I’d parked the ILX during the time I was hiking around. “Medecine” Ranch – anyone else want to guess that label on this crudely made wooden sign was a typo? A short hike up the road, this abandoned gas station offered some entertainment. Here’s the rest of that old gas station. Inside, it’s a griffiti’d mess. Need to use the restroom? 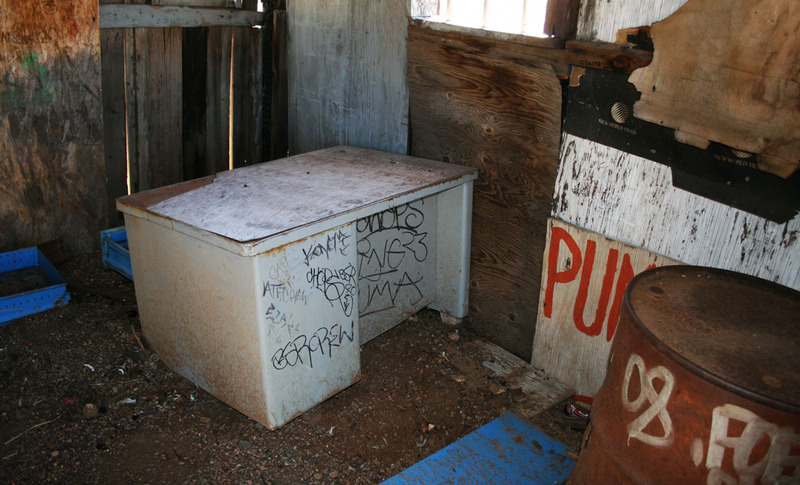 Not sure what the story was on this wooden shack out back. 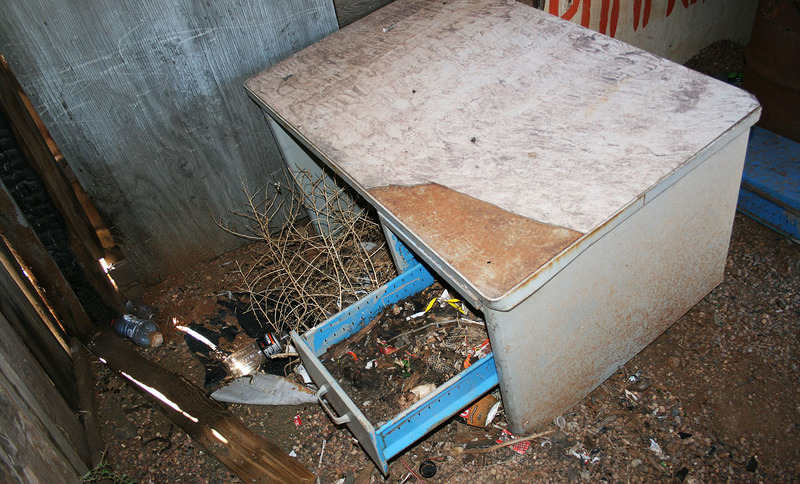 Inside, more trash, and a metal desk that might be nice with some restoration effort. And removing the dirt from those drawers. Headed to dinner later that day in the Legend. 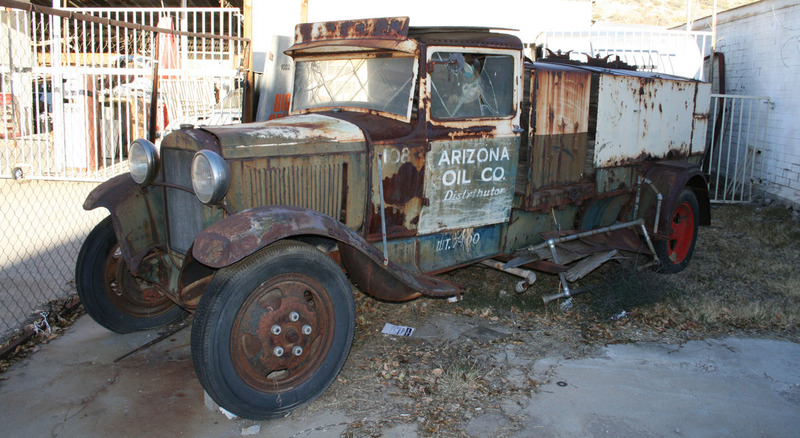 This entry was posted on December 26, 2013 at 6:31 am and is filed under Arizona, ILX, Road Trip. You can follow any responses to this entry through the RSS 2.0 feed. You can leave a response, or trackback from your own site. Hey Tyson I hope you had a good Christmas! Thanks Cody! It was a great one! Plenty of food, friends, and family (via FaceTime, at least). Plus I squeezed in a road trip for good measure. All in all, a perfect day. Hope yours was excellent as well. 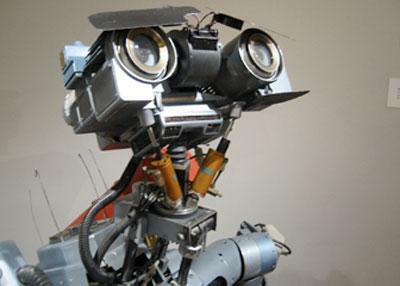 Those Gas pumps look exactly like Johnny 5! Crazy. That Canon and the abandoned places were beautiful! Great blog Tyson, looking forward to the next as always. Yeah we’re lucky to have good roads year-round, though the higher elevations definitely get their fair share of snow. Believe it or not, there are ski resorts within a couple hours’ drive of the Phoenix area that do fairly well for snowfall in the winter. 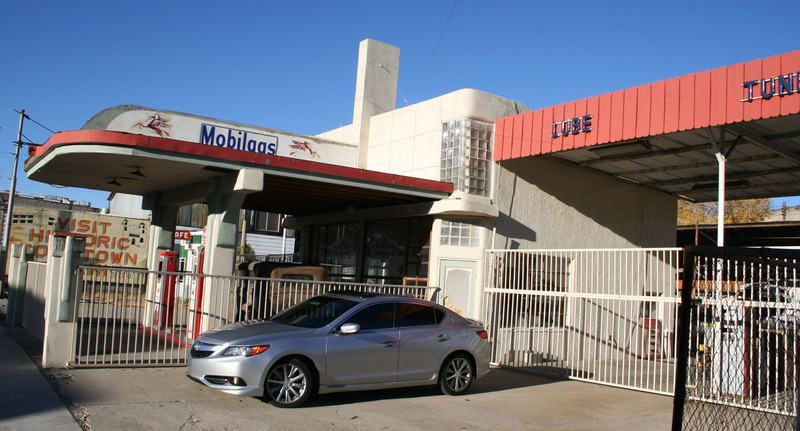 I enjoyed checking out that old Mobil station. I wonder how long it’s been since it was in use. Tyson, great post and I really enjoyed the photos. 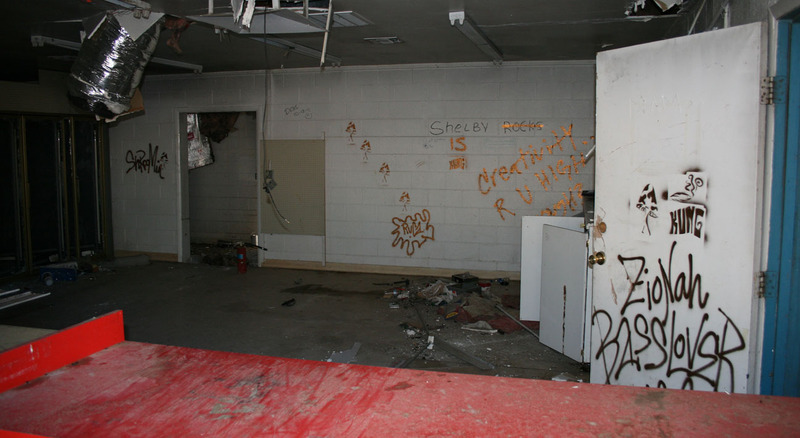 I’m too scared to go venturing into abandoned buildings but with your posts I feel like I’m right there. 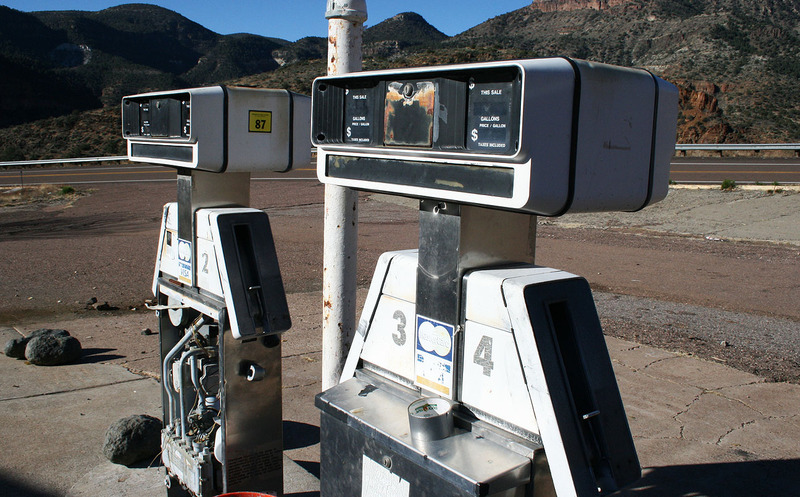 I loved the comparison of Johnny 5 and the old gas pumps. Gas pumps from then were used as inspiration for him perhaps? This canyon looks like a place I need to put on my 2014 list of places to see…gorgeous! Hey Jason, definitely! 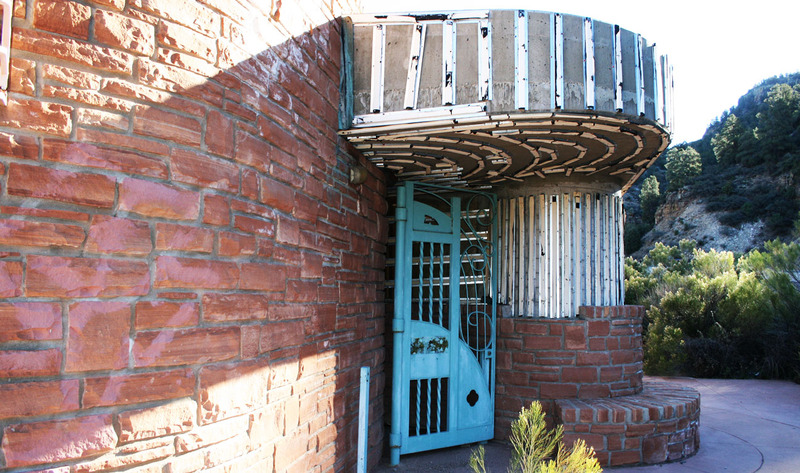 It’s a worthwhile side trip for anyone visiting the eastern Arizona area. 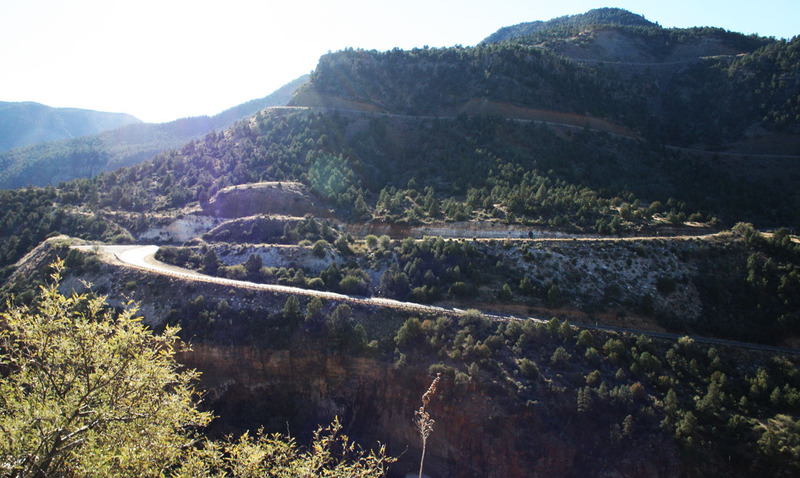 I’m betting that there are plenty of similar roads to be enjoyed in New Mexico. We still need to pin down a destination for our tandem drive in less than a month. Get those creative juices flowing. We just made the exact same 338 mile driving on Thanksgiving day 2014! Had similar experiences, as we enjoyed the same privacy as you. Beauty of this canyon should be experienced by anyone living within 100 miles. Don’t miss it! Andy, that’s awesome! I’m glad you had a good time. I need to get back up to the canyon again soon. Thanks for sharing your experience.